A STEM education is important for all students! Our after-school STEM activities help provide students with learning opportunities in an extended day environment where they benefit from hands-on activities. STEM occupations dominate the highest earning and highest growth jobs. Students who receive STEM education and go into these careers can expect higher wages and a greater demand by employers for their skills. Too many Oregon students are not completing high school with the mathematics and science literacy and preparation in STEM required for college and careers. Impact NW’s SHINE after-school program STEM education activities help provide students with learning opportunities in an extended day environment where they benefit from hands-on activities. In addition to foundational math classes, we have a variety of experiential STEM classes. Students can go green and bring STEM concepts to life with eco-friendly classes that teach students everything from learning to garden and compost to building renewable energy models using wind and solar power. Opportunities abound for students to go far with STEM, from using MIT’s Scratch program to learn computer programming to using LittleBITs for prototyping, learning, and fun. LEGO Robotics is a great way for students to have a creative, team-oriented, and fun STEM experience. Students can investigate life and physical sciences through experiment-based classes. 65% of scientists decided to enter a career in science before middle school. 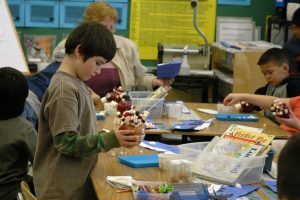 Elementary school is a critical window of time to get students excited about science. Our activity-based classes help students to imagine themselves as scientists, and picture a future career in a STEM related field.